According to the website www.doseofreality.nebraska.gov, every three days someone dies of a drug overdose in Nebraska. Nationally, more than 52,000 people died of drug overdoses in 2015 according to the CDC. Drug overdoses sharply increased during the first nine months of 2016 according to the National Centers for Health Statistics. They were driven by increases in opioid deaths, especially from heroin and Fentanyl. But for many people, their first exposure to opioids is through prescription painkillers. Crafting recommendations regarding appropriate prescribing to reduce the risk of substance use/misuse disorders. Developing recommendations regarding screening and appropriate treatment for those who are addicted. 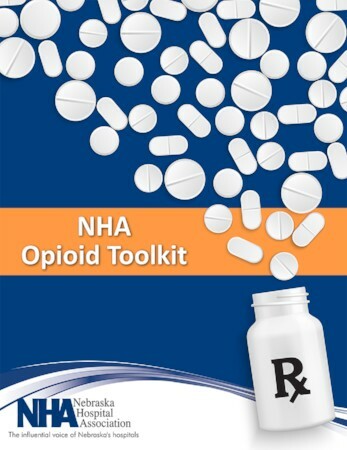 Addressing appropriate expectations on the part of the public regarding opioid use. The development of this toolkit has been a collaborative effort on the part of many. The Nebraska Medical Association and the Nebraska Pharmacists Association provided invaluable support and insight into the nuances of this epidemic. Participants of the Steering Council included representatives from Bryan College of Health Sciences and Bryan Independence Center, the Nebraska Department of Health & Human Services, and individual hospitals and health systems, including CHI Health, Nebraska Methodist Health System, Nebraska Medicine, Community Medical Center in Falls City, Boone County Health Center in Albion, Butler County Health Care Center in David City, Great Plains Health in North Platte, Box Butte General Hospital in Alliance and Fremont Health in Fremont. The NHA thanks both the members of the Steering Council and the content contributors for their valuable input. Medication Assisted Treatment (MAT) prescribers listed on page 55 may only accept specific insurance plans or may not be taking new patients. Some prescribers could be focused on treatment of pain management while others may be prescribing Buprenorphine for Medication Assisted Treatment for substance use disorder specifically, which are not delineated in the list.